This has been a very long day! My husband and I took my two sons to the park twice today. The first time my youngest decided to eat sand, bad idea, this evening the sand, um, came back up. Not so great. I also had a not so pleasant experience at my local super store (you can guess which one). My cashier literally walked away while I was talking to her, nice customer service. This evening my wrath seems to be aimed at social media. I love how my Facebook posts used to be seen by five times as many people as they are now. I really don't know if posting to facebook is worth it any more since they switched to wanting me to pay to have people see my posts. What does all this have to do with food? I cook and bake when I'm stressed. That has been the way I have dealt with stress as far back as I can remember. When I had finals in college everyone at my job was always excited, it meant dozens of fancy cookies would be coming with me to work the next day. When my mom was diagnosed with cancer I made 5 batches of cookies in one night. I made a huge cake when I defended my thesis during grad school (followed up by a big batch of biscuits and gravy). All-in-all cooking and stress seem to go hand-in-hand for me. These last couple of weeks have been stressful thanks to a major change in schedule with my oldest being out of school for the summer. I would love to say my two sons have adjusted beautifully; I can say that I have baked a lot in the last week :) Thanks to all this household stress I have been preparing a number of comfort food recipes. One of my favorite comfort foods is pasta, so a recipe for Pasta with Cilantro-Peanut Pesto in the June issue of Everyday Food caught my eye. This recipe has 12 ingredients. It takes 20 minutes of total time, all of which is active and makes 4 servings. I had no problems finding any of the ingredients at my local grocery and made no ingredient modifications. 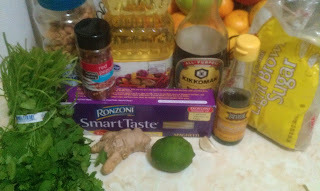 I added the full 3 tablespoons of soy sauce and instead of low-sodium I used regular. I prefer using regular soy sauce and not adding additional salt in recipes. Finally, I added the pesto to one pound of spaghetti and there was still leftover pesto. This recipe makes more pesto than the four servings suggested by the recipe I would say closer to 6-8 servings. I followed the remainder of the recipe as written. I love pesto and I was impressed with this recipe. I like that instead of the traditional basil, this pesto uses cilantro. Additionally, the soy sauce creates a great umami flavor not normally tasted in traditional pesto. The cilantro brought out a great fresh taste to the recipe and worked very well with the soy sauce. I found that this made a lot of pesto and I used an entire pound of pasta. Instead of stirring together all the pesto and pasta, I served the pesto on the plate so that my family could add the desired amount to their serving. 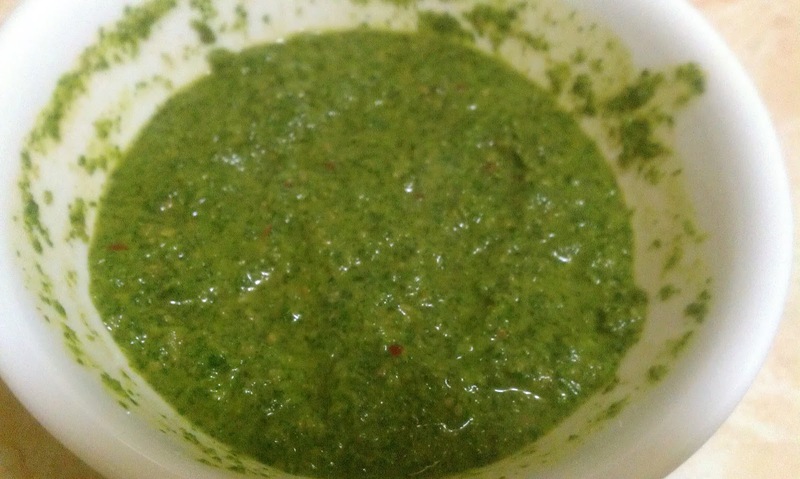 Overall, a great pesto recipe with delicious flavor. This recipe is currently unavailable online, but can be found in the June issue of Everyday Food Magazine. Here is another recipe for Cilantro-Peanut Pesto and one that uses rice wine vinegar here. I haven't tried these two, but I love hearing if anyone has or if they know of another great pesto recipe, feel free to share! I really liked that it uses cilantro, I love the taste of cilantro and using it in pesto was perfect! Thanks :) The rest of my weekend went much better and my oldest had his last t-ball game for the season yesterday. I'm happy that t-ball is over and he has decided that he is moving onto swimming :) The pesto really is fresh tasting, which I love! As for the recipe, sounds divine and I must try it-- when hubby is out of town. Glad I'm not alone with the baking when stressed :) My co-workers always loved the cakes and cookies also! I understand about trying things when your husband is out of town, my kids are easier to deal with food wise than my husband! I love this pesto. I often make it with farfalle pasta. I cook to relieve stress too. I make pesto with farfalle a lot also, the pesto does a great job of sticking to it and my two boys love the shape :) Glad that you cook to relieve stress also! This sounds amazing! Traditional pesto is one of my favorites, but I like the change of ingredients so I will definitely have to try this one out! I love traditional pesto also. I like that this pesto has a different flavor and was delicious!